Guided tours of the Contini Bonaccorsi collection until March 25th! From February 4th to March 25th it is possible to take a guided tour to the Contini Bonaccorsi collection, part of the Uffizi Gallery. Because of their particular set-up, the rooms of the collection can host only little groups of people. These rooms are located on the East side of the Uffizi palace. 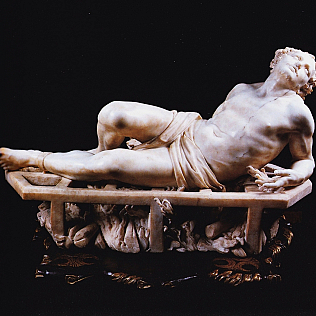 Priceless artworks are part of the collection: among them, the only one sculpture by Gian Lorenzo Bernini in Florence – the Martyrdom of Saint Lawrence. There are about fifty artworks by great artists, from 14th to 18th century: some of them are Italian as Cimabue, Andrea del Sarto, Andrea del Castagno, Giovanni Bellini, Veronese and Tintoretto, some others are stranger as Goya and El Greco. However the Contini Bonaccorsi spouses did not collect only paintings and sculptures, but also much furniture and various objects, among which 11 emblems by the Della Robbia. Originally the collection had about 1000 pieces, and the count Alessandro Contini Bonaccorsi decided to give it to the Italian State. After his death – in 1955 – his will was not respected. It was established to take part of the collection as a donation to Italian museums, while many pieces were sold, even abroad. An ad hoc commission was created, that gathered some of the top-level experts in the field. Nevertheless there were furious controversies: the matter was discussed in the Parliament and even in the court. Anyway, the result was that just 50 pieces – the 50 we are talking about – remained together. At the beginning they were exhibited in the Palazzina della Meridiana, at Pitti Palace, but during the ‘90s they were relocated at the Uffizi. It is necessary to remember that – as other important museums in the world – the Uffizi Gallery purchased other artworks originally part of the Contini Bonaccorsi collection. The peculiarity of the set-up, and – unfortunately – the persistent dearth of employees make necessary not only to limit the number of visitors that can enter the locals, but especially to close the rooms during some periods of the year. This set of problems makes these months a very unique occasion to book a visit to the collection!